The Great Oil Short Squeeze - Dohmen Capital Research, Inc.
Oil has fallen for a multitude of reasons over the past few years. A stronger dollar, a failure of OPEC to control production, an oversupply of crude oil, the Iran Nuclear Deal, U.S legalizing oil exports, the list goes on and on. When one of these reasons shows signs of a reversal, traders pile back into oil and are eventually burned when supply picks back up and the price falls back down. Technological improvements in the Shale industry have caused a structural change in the oil market. The U.S is rich in shale; it’s cheaper to produce and easier to expand production. Consistently, when oil prices rise, the U.S and other non-OPEC countries increase production bringing the oil price back down. Most traders fail to understand this. 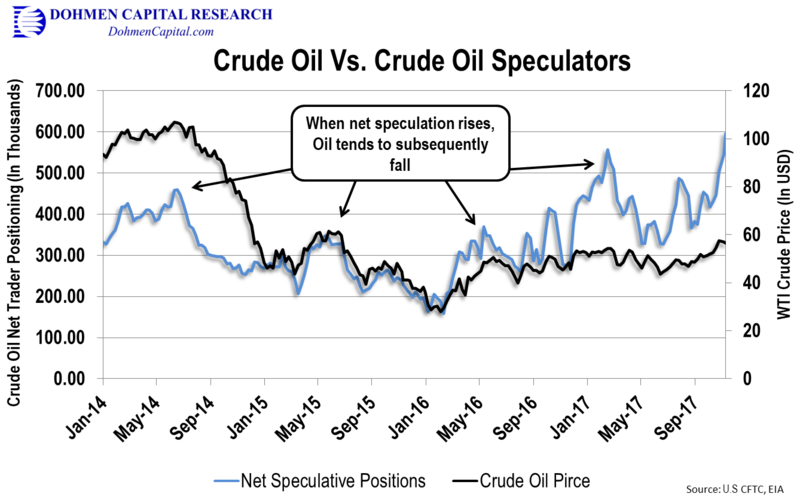 Just look at the oil prices and CFTC’s net speculative oil futures positioning. As you can see in the chart, right now, most traders have almost never been so bullish based on the incredibly high number of Speculative Positions (blue line). Most traders have a tendency of being wrong. Since early October, long speculative positioning has shot up over 10% while short positioning has taken a nosedive. Overall, this has created a 44% rise in net speculative positioning in a very short period of time. This is what a short squeeze looks like. The run-up in oil is not due to fundamentals, but due to rapid margin calls from short sellers and financial engineering by OPEC. Many bullish traders are piling in, believing this squeeze is signal of a real change, when it isn’t. This meteoritic rise in speculative positioning precedes an important OPEC meeting over the possibility of continued supply cuts that will occur in the end of November. Traders seem to be assured that supply cuts will permanently fix the oil market and cause prices to rise to $70 (or greater). While supply cut extensions are likely, we do not believe that will permanently fix the oil market. That being said, Saudi Arabia has been successful in financial engineering thus far and may be able to force a larger spike in oil prices. There is evidence that Saudi Arabia is selling long dated oil futures contracts to force “backwardation” in the oil market. This halts any hedging by American shale producers (increasing their risk of production) and also creates a false bullish signal ahead of the OPEC meeting. 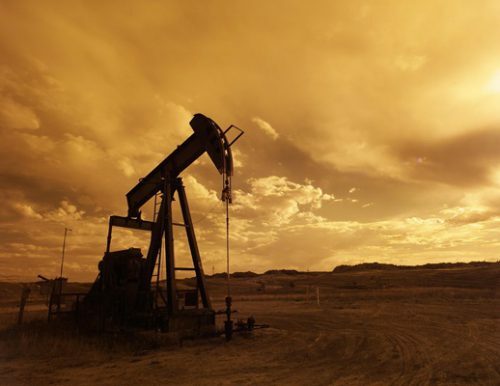 This could further exacerbate oil prices to the upside and cause it to rapidly increase. Remember, while net speculative positions are high so too are total short positions. Back in 2014, Speculative shorts sat at 90K positions. Today that figure is well over 200K. If the current short squeeze continues, oil could get driven much higher. Therefore, the risk of a short squeeze is high and prudent traders should remain cautious. While fascinating, the oil market is extremely complex and often tumultuous. Yet, it has such a major impact on the rest of the economy and other investments. For the time being, oil is the world’s primary energy source and smart investors should keep a close eye on its movements. And that’s exactly what we do for astute investors around the world. We analyze the data, chart our technicals, and examine the various risks and opportunities across the market. At Dohmen Capital, we make sure our client receive the most in-depth, thorough, and often contrarian research that will make (and save) their wealth. Now is a great time to join our elite group of clients including some of the most successful business owners and CEO’s around the globe. We are offering a 20% discount as part of our “Cyber Monday” special offers. Make sure to sign up today as this special will only be available for a limited time.